Included in RENDER are paintings, drawings and cut paper compositions that reflect the artists themselves, their devotions, commitments and that which brings them joy or gives them sorrow. Each artist in her own way shows us that Art itself is a transformative process. Mundane materials are changed through skill and creative vision into a product filled with meaning and the power to change the viewer and society. Marianela de la Hoz creates highly detailed realistic paintings and drawings exploring the very core of our shared humanity. 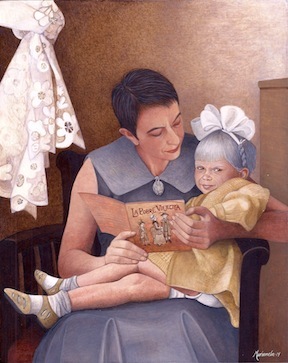 Her work, primarily in egg tempera, is meticulous and poetic. Recently her commissioned installation “Heaven and Earth, the Determined Freedom of an Undetermined Life” was acquired by the San Diego Museum of Art for it’s permanent collection. She has been the subject of numerous museum exhibitions throughout her career and included in countless group shows internationally. She is a resident of San Diego and was recently the recipient of the San Diego Art Prize for 2014. 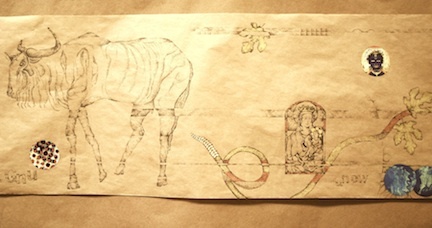 "Get On Your Own Horse"
Bhavna Mehta uses a knife, scissors and razor to cut intricate works in paper which involve storytelling. Creative since her childhood, her professional career as an artist began when her work as a software engineer ended. Over the last several years she has developed an artistic practice that while primarily centered on her intimate paper works also includes public art and sculpture. Mehta’s work has won her the admiration of curators and collectors. She is a 2014 recipient of the San Diego Art Prize as an Emerging Artist. Lynn Susholtz is an artist educator and entrepreneur. Her art practice, Stone Paper Scissors, has helped to shape the look of many San Diego Neighborhoods. The re-development of the property that houses Art Produce Gallery into a sustainable model of urban social and economic investment has won her community admiration and added to her awards as a visionary environmental designer. Her recent work, It’s About Time, combines antique paper products such as player piano rolls with drawings based on found imagery mined from commercial sources such as The New York Times. About Noel-Baza Fine Art: For the past 7 years Noel-Baza Fine Art has operated a retail gallery in San Diego's Little Italy. Gallery owners Tom Noel and Larry Baza closed that location in June embarking on a new phase of their business with this presentation of their first Pop-Up show.